Libyans exploded in excitement on Thursday afternoon at reports that Muammar Gaddafi had been captured and killed in his hometown of Sirt, where rebels have fought a grueling battle for weeks to crush his remaining armed loyalists. As television broke the news that Sirt had finally fallen to the rebel forces, gunfire began resounding around the capital. About 20 minutes later came the news, from a rebel commander in Sirt, that Gaddafi had been captured hiding in a hole in the coastal city, about 230 miles (370 km) east along the Mediterranean. Soon after came word that he was dead. The interim government says it is drafting a pathology report. In this city of 2 million people, thousands poured into the streets, firing guns into the air. The ships in Tripoli harbor blared their horns for more than an hour, and the mosques played prayers praising Allah over the deafening noise of car horns. Crowds of people converged on the seafront to move toward Martyrs' Square in the heart of the capital, where only two months ago Gaddafi's supporters held demonstrations in support of the dictatorship. A spokesman for the National Transitional Council (NTC), the interim government of Libya, insisted that the colonel was dead and that, while it would have preferred him alive and brought to trial, one "cannot go against God's will." 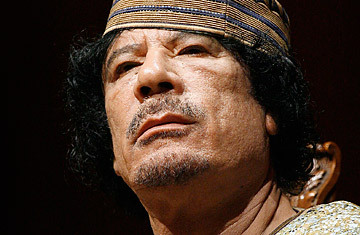 The likelihood that Gaddafi has indeed been run to ground will make Oct. 20 one of the most historic moments of Libya's history, the final demise of a 42-year-rule dictator who transformed this oil-rich nation into a terrifying authoritarian state even as he modernized what had been a largely illiterate desert country into a regional economic force. Exactly two months have passed since rebel forces stormed Tripoli and drove Gaddafi and his family from power. Yet while the rebels' NTC quickly assumed control over the capital, Gaddafi and his hugely powerful son Saif al-Islam vanished, slipping out of the city while Tripoli was still in turmoil. The International Criminal Court has indicted both men for crimes against humanity, for allegedly ordering the killing of unarmed civilians before the rebel force took up arms in mid-February. In the meantime, a well-armed group of loyalists in Sirt have held out, waging a grueling war of attrition against the rebel forces  even though the rest of the country had fallen to Gaddafi's foes. With the war dragging on, NTC officials were increasingly hampered in administering their new country. Prime Minister Mahmoud Jibril told journalists on Wednesday evening that Libya could "move from a national struggle to chaos." He said he was particularly concerned about the convoys of heavy weaponry that slipped into the neighboring country of Niger in August, after Tripoli fell. The rebels have said for weeks that they will be able to declare the war over when Sirt  the last Gaddafi stronghold  falls. With Gaddafi gone, Libyan officials say, the country can finally move beyond the revolution and begin rebuilding after months of war. "It means we will have a transitional government, then we will have an election in a few months," Mahmoud Shammam, the NTC's head of media, told the BBC on Thursday. See why Libya's interim leader says he's quitting. See pictures of Benghazi during wartime. See pictures of Gaddafi's tent shelters.